Fiction – paperback; Pan Macmillan Australia; 400 pages; 2017. Many of you will be familiar with Jane Harper’s debut novel, The Dry, which I read in 2016, long before it started to win every literature prize going, including the 2017 CWA Gold Dagger, the 2017 Australian Book Industry Award for Fiction Book of the Year and The Sunday Times Crime Book of the Year 2017. I loved The Dry so much — the claustrophobic portrait of small town Australia, the depiction of the landscape and the drought, the wonderful characterisation and the believability of the crime — that I couldn’t wait for the UK publication of her follow-up, Force of Nature, so I ordered it on import at exorbitant cost from Australia. The price, I think, was worth it. Force of Nature (to be published in the UK on 8 February 2018) is yet another page-turner set in the Australian bush starring Federal Police Agent Aaron Falk. This time round it’s winter, the drought has broken and a group of people on a corporate team-building exercise in rugged terrain have got themselves into trouble: one of their party has gone missing. Falk has a special interest in the search-and-rescue mission because the missing bushwalker, Alice Russell, is the whistleblower in a fraud case he is working on with his colleague, Carmen Cooper. Is her disappearance linked to their investigation? Has she met with foul play or done a runner? Or is it purely co-incidence? The book is nicely structured, swinging between two main narrative threads: what happens between the corporate team members on the weekend-long hike in the (fictional) Giralang Ranges; and the ensuing investigation by Falk and Cooper. From the outset we know things are not going to go well on the hike. There are two groups — one comprising solely men, one comprising solely women — who go off in different directions, but the women never make their rendezvous point on the second night. Instead, fraught, frazzled and beset by petty squabbles, they get lost and cannot agree on the best course of action to take: set up camp and wait for daylight, or keep moving. Meanwhile, Falk’s narrative thread highlights the pressure he is under from on high to solve the fraud case and at the same time we get to see the more human side of him: we learn about his fraught relationship with his late father and come to understand the loneliness of his life and his (unrecognised) need for human companionship. What makes this book work is the characterisation. Harper provides intriguing back stories for each character, particularly the women in the corporate group, giving each of them a plausible motivating factor for wanting nasty, short-tempered Alice to “disappear”. And she does a terrific job of creating not only mounting tension — showing slowly-but-surely how and why Alice goes missing — but also a sense of foreboding through the clever use of a news story familiar to the women: that of a serial killer, who butchered and buried a number of victims in the Giralang Ranges (loosely based, I suspect, on the real-life backpacker murders of the 1990s). If I was to have criticise any aspect of the book it would be that we never quite find out what happens to Falk’s fraud investigation. 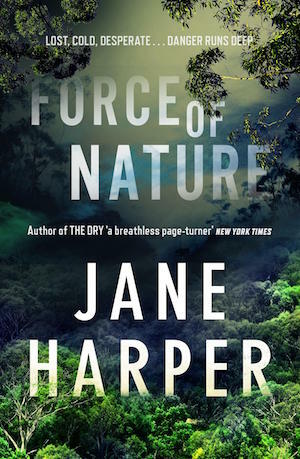 But in the grand scheme things it doesn’t really matter: Force of Nature is a satisfying read, one that will delight fans of The Dry and perhaps attract a new audience to Harper’s work. Call me greedy, but I honestly can’t help but be impatient for the next novel in this intriguing crime series. This is my my 10th book for #AWW2017 which means I have now completed this challenge for the year. Expect a wrap-up post in a few days. Ha ha, team-building makes me feel quite murderous too! I hadn’t heard of this author but this sounds excellent. So does The Dry. Oh, do read The Dry first: it introduces Falk and it’s a brilliant story.